The 2007 Oxnard Fall League City Championships was moved to January 14th-17th, 2008 due to weather conditions as well as a lot of teams going on vacation due of the holiday season. Plus there are a few teams finishing some of their league games. Wild Cards' first game in the AMCOM Ring Tourney against Balls 2. The game was close. Wild Cards started off really good. Awesome pitching and defense throughout the game. The WC offense was decent enough to lead 5-1 through 4 innings. It was smooth sailing for pitcher Chris Goodenough and the solid Wild Card defense as they led 7-3 throughout the game. However in the bottom of the 7th, Balls 2 came up with a couple of cheesy hits which tied the game 7-7. Wild Cards managed to retake the lead 8-7 in the 8th. Once again, Balls 2 managed to come back in their bottom half of their inning. A walk, a couple of cheesy hits and an error tied the game 8-8. With 1 out, Balls 2 didn't want leave any more runner stranded, so they brought their juice bat and finally produced the game winning run to beat the Wild Cards 8-7 in extra innings. team who he plays with in the Monterrey Park Leagues and in other tourneys. They are the same team who placed 6th or 7th in the Hispanic World Tourney in Arizona last year. So pretty much the Wild Cards have their hands full as they face a really good USSSA team. For the 2nd consecutive game, Wild Cards did not hit the ball like they know they could, as they go cold for the first 3 innings, however they were able to keep All Jacked Up close to within striking distance. Trailing 5-1, going to the 4th inning, Wild Cards rallied back with 5 singles (most of them to right field) added with a fielder's choice and a sac rbi which resulted to 3 runs, making it 5-4. All Jacked Up answered back with 4 runs of their own to lead 9-4. Wild Cards started rallying back by picking on their slow right fielder... a solo HR by Chad Emery and a 2 run HR by Raul Narez which cut the lead to 9-7. Not fazed, All Jacked Up answered back with cheap basehits but it was effective enough for 5 runs to stay ahead 14-7. Going to the top of the 6th inning, Wild Cards scored a big 8 runs, including a 3-run HR to right field by Francis Unson. It put the Wild Cards up 15-14. However, in the 7th, All Jacked up rallied again with 1-run to the tie the game. They had a chance to score the winning run with the bases loaded and 1 out, but pitcher Chris Goodenough backup by his team mates escaped with the bases full for the 2nd time. This intense game went on to extra innings, 15-15. In the Wild Cards 8th inning, they continued to pick on their right fielder, scoring 4 runs to lead 19-15. The Wild Cards were going to escape with an extra inning win, however, it did not help that the ump was making some F--- Up calls during the game, especially in the late innings. Wild Cards did a great job but they went on to lose in a heart breaker, 20-19 by giving up 5 runs on 2 HRs 3 cheesy hits and one big Game Winning hit in the last inning. tried to fight back with their strong offense, but Balls 2's bats were just way too loaded, juiced, shaved and even their batters were just hammering the Wild Cards. Hard line drives that past the speed of sound just went through the Wild Card defense. Not even the lights turning off in the middle of the 6th inning could cool off Balls 2. Wild Cards go quietly into the night as they lose very bad and go 0-4 in the Ring Tourney. Despite many confusions with league schedule, the Wild Cards got an early Christmas present..... a 2nd chance to overthrow the league leading DJ Auto. Thanks mainly in part of Creative Home Loans' demise from the league. With Creative Home Loans quitting the Thursday Night Novice/E league, the softball director basically did not count any of the wins and losses of Creative. Basically it took away some of the wins and losses from other teams who played Creative. By doing that it also took away the one loss from the Wild Cards. Therefore giving them an opportunity to tie with DJ Auto (6-4) for 1st place. All the Wild Cards (5-4) need was to win their last game against Kuruption (4-5) and they win the tie breaker and take the league against DJ Auto. If they lose their last game, not only they lose any chance of winning the league title, but they fall to 2nd place and wind up in a 2nd place tie and are force to play a tiebreaker against Kuruption. If they lose the tie breaking game, the Wild Cards will eventually fall into a dismal 3rd place but by 1 game. After struggling the last few weeks and losing their 1.5 game lead for first , Kuruption erupted with 7 runs in the first inning and they never looked back at this game, as they crushed the Wild Cards 24-11 and destroyed the Wild Cards' chance of winning the League title. With the win they force a tie breaking game against the struggling Wild Cards. Winner takes 2nd place, the 2nd place shirts and gets an invitation to Oxnard City League Championship playoffs. After their embarrassing loss and getting knock out of the league title, the Wild Cards recovered in the 2nd game and managed to win convincingly by returning the favor as they beat a tired Kuruption team, 17-11. Took advantage of a tired Kurption pitcher, by scoring 11 runs in the first inning which sealed the fate for Kuruption. With the win the Wild Cards take 2nd place and get a special invitation to the city championships. Same Hot weather, Same result. For the second year in a row, Wild Cards go winless again in the biggest tourney for SCMAF-The Tournament of Champions. Though they were missing a few key players, the Wild Cards were able to score an abundance of runs against the 2 teams they faced (Pine Stump and One Time). Unfortunately defense and pitching wasn't able to hold the opposition. On paper it look like a Wild Cards victory against Pine Stump, turned out that they came out to be the victor. In the first inning. Wild Cards gave up 7 runs in the first inning. However they came back with 3 mores runs plus a Cody Stanley Hr Run to cut it down 6-4 the Wild Cards. Raulo Romero still struggled with his control as the defense made way too many mistakes. Wild Cards tried to make a game of it, but everything slowly collapse in the last 2 innings. Pine Stumps pollaxed the Wild Cards 21-11. After a an hour an half break, Wild Cards were refreshed after the hour and half break. So refreshed they took a 14-0 lead over One Time after the 2nd inning. With only 5 innings to go and well on their way to win their first game, the Wild Cards ran out of gas in the hot Palm Springs weather. From the 3rd inning on, One Time slowly crept back into the game in every inning, then finally past them with a 14 run 5th inning. Wild Cards couldn't recover as they get punked by One Time, 26-16. Note: After crushing the Wild Cards both Pine Stump and One time went 2 and out as they went 1-2 throughout the tourney. Hex/Bad Guys won the Rec Division and Chamucos won the Lower E division. Wild Cards lacked the enthusiasm and spiritlast night, as they get beat really bad in the 9:00 game against Dial Construction. The Wild Cards started hot in the beginning, but the defense went ice cold and couldn't hold the 3-1 lead. It was close for a while, but Dial Construction's bats were too hot as they bombard the Wild Cards with 8 HRs. They eventually blew the game wide open. Wild Cards get crushed again 20-5. Dial Contruction moves back into first place tie with Kuruption. From the looks of it, Wild Cards were on the verge of losing their first second consecutive league game lost since April 2007 (Spring Season). Wild Cards still struggling on offense. Still Ice cold, however the pitching and defense was able to hold DJ Auto to 8 runs. Despite having 2 strikeouts and a triple play against them, the Wild Cards were able to rally back in the bottom of the 6th inning with 8 singles, topped off by a 3-run HR by Chad Emery. It prove to be to be the game winner. As Raulo Romero shut down DJ Auto in the bottom of the 7th inning to pick up the save and give starting pitcher Hector Calderon the win. Wild Cards win 9-8 to knock DJ Auto of first place. Kuruption is now in first place by 1 game. First weekend for the Wild Cards coming out of a disappointing tourney in Simi Valley, last month. Now the WC are playing at the Glendale Sports Complex in the first weekend of November . Home of the Wild Cards' 2-time 2006 SCAMF Qualifier MVP, David Loyola. This was a special charity softball open level tourney that they throw every year. They let you use any bats (yes Ultra 2s are legal) with hard softballs but they also added unlimited arc in the mix. On top of that the Glendale Sports Complex has 3 special unique fields that have different rules and different dimesnions for each one. On Field 1, the left and right field fences are about 295 ft with an 8ft high fence while in center is about 320 ft. With this unique dimensions, its unlimited HR's so basically you can hit as many as Home Runs as you want with their hard softballs. Field #2 is a short fence and it has a one up rule. Field #3 is a baseball field that has their fences at 390 ft all the way around. Its unlimited Home Runs on this field. Btw, If you hit it past the outfielders, its an automatic Home Run. So all the Outfielders will be running all day. This Saturday will be a fun challenge for the Wild Cards as they take on the best Glendale teams in this open division. After breaking the ice, fighting the jitters in their stomachs and winning their first game, the red hot Wild Cards played their second consecutive game against the The Bums on Field #2. Their 2nd game wound up to be a no contest. Wild Cards took advantage of the Bums' pitcher's short 10 ft arc pitches as they scored a big 12 in the first inning, a 7 run rally and another 3 run inning to add insult to injury. Even though it lasted only 4 innings,every Wild Card had at least 2 hits and at least 1 rbi. Half of the hits and rbi's belong to Bobby Garcia and Anthony Dugas. They both combined for a 6 for 6 , 5 runs scored, 2 triples, 2 doubles and a total of 6 rbi to lead the team to victory. Not to be undone by the dynamic duo, Cody Stanley hit a monster 385+ Ft Home Run which was thought to be impossible. Wild Cards destroyed the Bums in the 2nd game, 22-8. The Dugas and Garcia combo knocks out TKO!! For the 2nd tourney in a row, the Wild Cards advance to the playoffs. Instead of being the highly favored team, the Wild Cards are now the underdogs playing against an Upper E Division team called the Roving Dogs. This time they will be playing in a very short field where the fences are only 275 ft all the way around. Trying to erase the memory of losing to a inferior team in Simi Valley, last month, the Wild Cards will face an uphill battle against the team who has a pitcher that can pitch up a 20 ft arch and hit a the center or back part of the plate. In the first inning, Raulo Romero and the Wild Cards managed to hold off the Roving Dogs in their first inning, as the the Roving Dogs left the bases loaded. Wild Cards took a 2-0 lead in their bottom half of the first. However Roving Dogs answered back with 5 runs in the 2nd inning only to give it back. The game was tied for a short bit, until the next inning, as the Roving Dogs lead 8-5. Cody Stanley hit a solo HR to make it close 8-6. Then in the top of the 4th inning, Roving Dogs broke it open with 5 runs-- thanks to a couple of 2 2 Run Home Runs. Then their next inning they scored 4 more runs to almost double their lead on the Wild Cards 17-8. Wild Cards were facing defeat and elimination from the tourney, but managed to light the fire in their offense, as the tide changed in their favor. In the bottom half of the 6th inning, the Wild Cards switched from 120 MPH bats to 98 MPH bats to prevent them from going over the HR Limit. By making adjustments they rallied back from a 9 run deficit by scoring 4 runs on 4 singles, 2 doubles and a fielders choice to bring them to within 5 runs. The inning would have ended early for the Wild Cards if it weren't for Justin Carpenter switching from an Ultra 2 to Synergy Flex, because the double he hit would have gone over and it would have been an out. However instead it hit the very top of the fence for a double to score a couple of runs and extended their inning. Roving Dogs came back with an insurance run in the top of the 7th to lead 18-12. It was the last at-bat for the Wild Cards and their playoff hopes are on the line. Undaunted, they rallied back. It started off with a walk by Chad Emery, then followed by back to back Home Runs by Dugas and Loyola. After the 2nd HR, the Wild Cards used all their HRs because of the 1-up HR Rule. So they can't hit any more HRs anymore or it will be an out. So the Wild Card did the next best thing.... hit 6 straight singles. Singles by Stanley, Carpenter, Palmer, Lara, and Zamora cut down the lead to 18-17. The last single was the biggest hit by Romero which drove in 1 more run to finally tie the score 17-17. All the singles in that inning, set up the winning run. With Runners first and third with one out, a sacrifice fly by manager/player Virgil Tomas drove in the winning run as Nap Zamora crossed the plate. Tomas' sac fly to left center almost went out, fortunately it didn't ... Wild Cards win a Thriller 18-17 and advance to the semi-finals against Level X. In the semi-finals, the hot streaking Wild Cards take on another Upper E Division team-Level X. This time on the Baseball field. The game was very very close as both teams take turns taking the lead. Low scoring thankt to very good pitching from both teams. Level X pitcher throwing those 20 ft arc is making it difficult for the Wild Cards to put up some offense, but Wild Cards' pitcher Raulo Romero was doing the same to Level X hitters. It was until the 5th inning that the Wild Cards took advantage of 2 Level X errors and cashed it in to lead 9-6. Wild Cards score an extra run in the bottom of the 6th. With the score 10-6, Level X rallied back with 2 runs in their last at-bat but came up short as they lose in a nail biter 10-8. The difference in the game was Raulo Romero's 3-run Home Run to right field in the bottom of the 3rd inning with 1-out. The championship game started at 9:00 PM on the baseball field but playing all day and all the way through the night in Glendale plus beating the 3 best E teams in that tourney, took a huge toll on the Wild Cards. The Park Bums took advantage of the weary Wild Cards by scoring 3 runs in the first. It was over in the fifth, as the Bums broke it wide open. They never looked back to win, 19-4 and claim their 8th Glendale Winter championship, . The game was close than the actual score as the Bums outscored all their opponents by at least 30 runs in every game except for the championship game where they only won by 15. Nonetheless Wild Cards fought hard and took 2nd place. Not bad for a team who played in their first tourney in Glendale. Wild Cards won 3 straight games in their round robin but couldn't advance past the first round as they slumped and were eliminated by Second Wind. The 2nd game was a very good game both teams played good defense and made it tough to score, Wild Cards scored 2 runs in the first and tied it. It was back and forth with the lead. After the Wild Cards tied it 2-2, Barrel Monkeys retook the lead 3-2 in the third inning, then they gave it right back as the Wild Cards score 3 in the fourth inning to lead 5-3. Only to be tied again in the Barrel Monkey's fourth inning. It was still 5-5. Not too much offence from the fifth to seventh inning. But in the Wild Cards' fifth, with 2-out, Raulo Romero got a hit and a error on the play which set it up for Virgil Tomas' line drive up the middle as Romero scored the go ahead run. Then they scored an insurance run the following inning to make 7-5. That proved to be enough for the win as the Wild Cards' defense shut down the Barrel Monkeys before they could do any more damage. Wild Cards held on to the lead and won 7-5. Altered Egos were the 3-time SCMAF REC Qualifier champs of Simi Valley. Wild Cards also have won 2 SCMAF Qualifiers (Simi Valley and Torrance). This was a pretty good match-up between the Wild Cards and Altered Egos. It was an offensive see-saw battle but near the end, defense and pitching prevailed. As the Wild Cards were able to hold on for the win. Wild Cards go 3-0 in round robin and advance to playoffs. After an hour and half break again, the Wild Cards just couldn't get it going in this game. Second Wind's defense were making solid plays, that the Wild Cards were having a very difficult time getting hits together. Stanley, Loyola, Palmer, Emery and Dugas were all struggling at the plate either hitting it out over the fence for an out or just popped up, easily. While the Wild Cards were struggling in offense, Second Wind put up 7 runs to the their five in the first 3 innings, then they dropped another 5 runs in the fourth & fifth innings to go on to beat us 13-9 in 7 innings,so the Wild Cards's days was over at 3-1 and ended up in 4th place. Second Wind advances to the Champioship Game against Chamucos who surprisingly defeat Unks and Nefs. 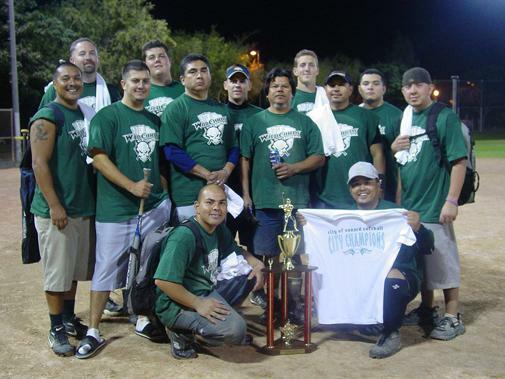 In the Championship Game, Chamucos easily won the Championship with out a problem. Despite not having a full squad, Wild Cards had to play with 9 guys against first place DJ Auto who are undefeated coming into Thursday night. With Chad Emery and Shawn Palmer playing hurt and missing key players (Ray Jurado, Joey Ortiz, Jaime Rabago, Hector Calderon), it looked liked the Wild Cards were going to suffer back to back losses in hands of Dj Auto. However that wasn't the case, as the Wild Cards learned a lesson from their last game against CHL, made adjustments and just bombarded the DJ Auto with a barrage of hits and runs. DJ Auto came back on 2 big errors in the 3rd inning and scored 7 more runs in the 4th inning to take a 16-9 lead. Not willing to give up, Wild Cards worked hard during the game and sliced the lead to 16-14, then finally scored a big 9 runs in the 6th inning. DJ Auto tried to come back in the 7th with 1 run but could not mount a late inning attack. DJ Auto loses 23-18 and moves into a first place tie with Creative Home Loan and the Wild Cards. Even though the Wild Cards were missing Shawn Palmer (injury), Anthony Dugas (work) and Ray Jurado, this game was still a see-saw battle between the Wild Cards and Creative Home Loan. Pretty much an offensive game until the 6th inning, as the Wild Cards couldn't keep up with the relentless hitting machine of Creative Home Loan and lose 28-15. CHL, scored in every inning except the 2nd inning which was more than enough to hand the Wild Cards' their first loss since June 21st v.s. DJ Auto (City Championships). The loss not only snapped their 14 league game winning streak, but knock the short handed Wild Cards out of first place. In their first opening game of the E/Novice Fall League, Wild Cards took the first game and won easily in the 2nd game to extend their league winning streak to 14 games. At first the Wild Cards came out rusty against Kuruption in the first game, only scoring 6 runs in the entire game but managed to hold on to win 6-5. Thanks in part to superb pitching and defense. Like their first game, the Wild Cards' 2nd game of the double header was a low scoring affair for 3 innings. However in the top of the fifth, the Wild Cards bats came alive against their old nemesis, Dial Contruction. Scoring 3 in the fifth, 1 in the 6th and 7 runs in the top of the 7th, the Wild Cards opened the flood gates and cruise on to win 17-4 against Dial Contruction. Ever since having a a so-so July month, the red hot Wild Cards came back strong. From the month of late July to October, the Wild Cards totally dominated their league, won 4 straight tourneys and won the Oxnard City Summer League Championship. Mainly because of the team commitment and the team chemistry that helped them to be where they are now. The spirited Wild Cards show they can work together as a small choesive unit to acheive one goal.... victory. They are so calm and smooth, that they can comeback to beat you with their hi powered offense and stifle you with their tight defense led by their strong pitching. Their 28-1 record (from July 24th-September 29th) shows how dominating the Wild Cards are. They have 14 league game winning streak and a 11 tourney game winning streak. The only blemishes the Wild Cards had, was that one loss they got in August 11th (Chino) against the Shockers, which went 9 innings. The other was the 805 tourney in Oxnard which had way too many discrepancies that were going against them as well as mother nature. Through it all, they have accomplished most of their goals and hope to stay hot and achieve more. Originally the 805 Tourney in Oxnard was cancelled after the first game. Then 2 hours later it was uncancelled by the 805 Tourney director. The Wild Cards eventually backed out of the tourney due to way too many last minute discrepancies that were going against them as well as mother nature. Unlike the past 2 tourneys, this SCMAF qualifier in Torrance, was a sweet easy Victory but a short one for the Wild Cards of Oxnard. The weather was perfect, the game schedule was perfect with an hour and a half break, all the Wild Cards had to do was get by the tough Party Boys from Santa Monica, the Torrance SCMAF REC Qualifier champs (May 12). Bring It On, and the 2007 SCMAF Summer Divisional REC Champs, What The?. What thought would be a very tough challenge turned out to be 3 wins for the Wild Cards. That would enough to win their division as the Torrance softball director, decided to go with the team with the best record, win their REC division instead of the regular playoff and championship game format. The First game started on time 10:00 AM. The Wild Cards' first opponent were the Party Boys from Santa Monica. This team is similar to the native american team, Baad Medicine in Vista. The only difference between the Party Boys and Baad Medicine is that the Party Boys were all Mexican, they wore Yellow shirts instead of the red uniforms and they didn't score as many runs as Baad Medicine did. Regardless of the similarities between the Party Boys and Baad Medicine, the Wild Cards were too much for the Santa Monica team as they crashed their party and pretty much gave them their first loss of the tourney. It was actually a close game because the Wild Cards slumped a little bit in the ealry innings, however they managed to score only 11 runs. Thanks to good pitching and a tough defense, the party was over for the Party Boys as they lose to Wild Cards 11-7. A marquee match-up between 2 rec champion teams, Bring It On, who won the Torrance SCMAF REC Qualifier on May 12th and one week later, the Wild Cards won their SCMAF Qualifier in Simi Valley on May 19th. It was going to be a tough see-saw battle between these 2 champions. However, the Wild Cards who were missing key players, still came out victorious as they won 17-5. Thanks to timely hitting, strong pitching and defense. 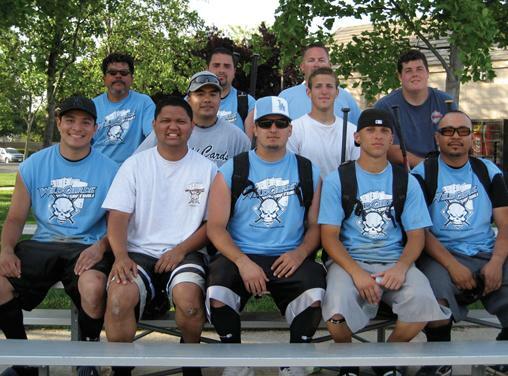 The 2007 SCMAF Summer Divisional Rec Champs, received a lesson from the Wild Cards about team work and not giving up. As What the? Tried to bat first and put away the Wild Cards early scoring 9 runs in the first 2 innings to lead 9-2. However Wild Cards were acustomed to coming from behind. Undauted and not fazed by the big lead, they came back with 7 runs against What the? and tied the game 9-9 in the 2nd inning. Thanks in part to What The? 's shakey defense and 4 other pitchers who could not find the strike zone. From there on, the game was pretty much over. Eventhough What The? tried to make a late comeback, they couldn't hold the Oxnard team off. Wild Cards, scored 13 runs in the last 3 innings to win the game, 22-15. 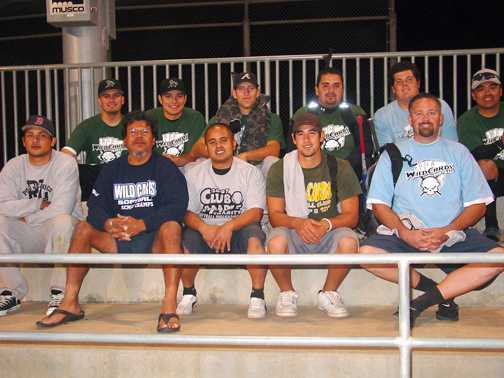 Its been a awhile that the Wild Cards haven't played in Oxnard since they won their league title August 23, 2007. Now one month later, Wild Cards bring their undefeated 10-0 record to the Oxnard City Championships against 6 of the toughest teams in Oxnard. First team to win 2 straight games are Oxnard City Champions. Baad Guys took advantage of the Wild Cards’ rust and lead 6-2 after 2 innings. In the top of 3rd inning, The Wild Cards rallied back scoring in every inning. With major adjustments to their pitching and defense, Wild Cards survived a scare and managed to hold on to win 18-12 and advanced to the Championship Game. The 2 top REC 2 division teams face off in the Summer League City Championship Game. For the first 6 innings it wasn’t a close game. Wild Cards took a huge 15-7 lead. The R&R Guys tried to make it a game, but too many mental mistakes and errors made it impossible to overcome the battle tested Wild Cards. Ladies and Gentlemen, the Wild Cards win their 2nd Oxnard City Championship. Congrats to the players and fans for making it an undefeated season. Like the weather in Chino, Vista wasn’t that hot, but it was really warm. Its been over a month that the Wild Cards haven't play in a tournament. The last time they played was August 11th at Ayala Park, Chino where they won their first AMCOM Qualifier, snapping their 12 game losing against teams outside of Ventura County. Now the Wild Cards are playing a tourney in Vista, San Diego, where they have a chance to continue their winning ways. However with Raulo being sick and a couple of players hurt, this 10-man team have to go through 3 other teams to win it all in Vista. Already down by 2 runs, Wild Cards took control of the game and managed to hold off My Bad, 12-9 and a well deserved hour break. This hour break in the tourney was the first time they had once since July 14th. Pound 4 Pound drew first blood to lead 2-0 over the rested Wild Cards for 1 inning. Only to give the runs back to the Oxnard team, thanks in part of in consisted pitching and a lousy defense. Wild Cards cashed in all their errors and walks for their 3rd consecutive win in the Vista Tourney. Wild Cards win 14-4 and advance to the championship game. Not only a championship game, but a grudge match from the first game. Baad Medicine looking to seek revenge as they faced the undefeated Wild Cards for the title. After spotting the Wild Cards, 2-0, Baad Medicine came back and surrounded the Wild Cards with a 14 run rally to lead 14-2. With a couple Wild Card players hurt (in the beginning of the tourney ) and Raulo with a fever, everybody including the softball director and the umpire thought the Wild Cards were so demoralized that they couldn’t come back from a 14 run bashing. Not even the U.S. Calvery could have saved them. However unlike most teams who would just give up, the Wild Cards who were unfazed, fought their way back, scoring in every inning. The battle tested Wild Cards led by their gutty shortstop, rallied back with 6 runs in the 2nd inning to trail the Native American team, Baad Medicine 14-8. Baad Medicine held strong by scoring in their bottom of the 2nd inning and another 3 runs in the third inning. No matter what Baad Medicine threw at them, the Wild Cards withstood the arrows and tomahawks and turned it around. They eventually took the lead in the fourth and never looked back. Baad Medicine who were ready to scalped the Wild Cards, were totally shocked they came back. Unfortunately they couldn't match their oppositions firepower as they surrendered 29 runs to lose 29-18. Virgil Tomas, Shawn Palmer, 2 by Anthony Dugas and a Huge Grand slam by Hector Calderon. With the return of Hector Calderon, he not only crushed a Grand Slam but with superb pitching, stifled the Head Hunters with no runs on 2 hits for the first 3 innings. Raulo Romero took over and shut down them down too, only allowing 2 runs in 3 innings. Other than the 4 runs that the Head Hunters scored in their last at bat, it was an almost perfect night for the Wild Cards, great hitting, good defense and awesome pitching by the dynamic duo. Despite Distractions, Wild Cards win Big! Aside from the wild and unusual antics by one of the Wild Card players and his friends, the team managed to fight off the distraction and were able to dominate over Victory Outreach 37-14. Despite not having Raulo because of his birthday and Raul on the DL, the Wild Cards scored a team season high 30 + Runs. Fred Hernandez who step in for Raulo did a good job holding off the hot bats of Victory Outreach. The hot hitting Wild Cards got a barrage of hits led by team captain, Ray Jurado who hit 1 HR and drove 4 RBI’s while going 4 for 5. On top of that the young rookies Cody Stanley and Chad Emery both went 5 for 5, 1 Hr and 4 Rbi’s, each. All these runs were enough to give Fred Hernandez and the Wild Cards the win. Wild Cards can't find Victory Road. The Wild Cards were 1-12 against teams from L.A./Orange County, in 2006. 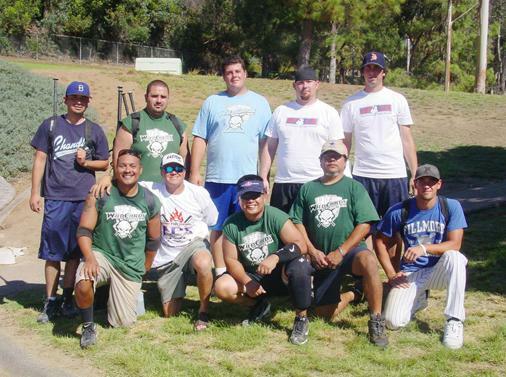 The only win came against Catch-22 at the Summer Divisional in Cerritos. In 2007 Wild Cards are still looking to break the curse against L.A./Orange County teams. But their record doesn't show it, as they are right now 1-9. However, the Wild Cards must love Ventura County as of now, they are 10-3 in 2007. Last year, their record was 19-6 in Ventura County. It really must be the home cooking. Wild Cards must get on the Highway to Wins, exit Trophy Way, past Smack Down Hotel and make a right to Victory Road which leads to the Road of Champions and enter the Promised Land!! For the 2nd weekend in a row, the Wild Cards come back to Big League Dreams – Chino Hills to enter AMCOM/I.S.A Men’s E Softball tourney. Half of the Wild Cards squad consist of young raw players. Half of the team being inexperience and young, the Wild Cards played tough against A&V Softball Champs Power House. Score 3 quick runs but faulty base running killed in their inning and a chance to score more runs. Eventhough the game was low scoring, and runners left on base, Cody Stanley hit a solo HR to help give the Wild Cards a good 4-2 lead until the 4th inning. Power House rallied back with runs and took the lead 6-4. In the 6th inning, Wild Cards came back with 2 runs to tie the game 6-6. The game went to extra innings, Wild Cards had many opportunities to win the game but could not capitalize. It was in the 9th inning, Power House hit a walk-off Home Run to win the game 7-6. This was a hard fought game. Both teams tried to take the advantage over the other but only to relinquished the lead in the next inning. Game Over took the lead 3-0 in the top half of the first. Wild Cards took the lead 5-3 in the bottom of the first inning. Only to give it back to Game Over 6-5. Then it went 7-6 Wild Cards. What started off like an offensive scoring game turned out to be a little more defensive game through out the later innings. Both teams left a lot of runners on base that would have blown any other team away. It was until the top of the 7th inning with the Wild Cards trailing 8-7. All they had to do was get by the inning, because they knew they had a chance to either to tie the game or win it in their inning. However that wasn't the case, Game Over had the bases loaded with 2 out. Wild Cards pitcher Raulo Romero had 2 strikes on the batter (who struck out once in the game) and it looked like he and the Wild Cards were going to dodge another bullet but a very costly error opened the flood gates which destroyed all hopes of a come back. Wild Cards went quietly as they lose 13-7. Young and inexperience Wild Cards took on the sand bagging team, Flip the Switch. A team that should have been in the D level division. Regardless, all through out the game, Flip the Switch did what they did flip the switch. Of course they didn't real care about sportsmanship, as most of their batters were trying take out Wild Cards' pitcher Raulo Romero, by hitting hard line drives at him. Of course thats was part of the game, but for them to think that was funny, laughing at what they were doing, was unsportsmanlike. With no chance of making it to the playoffs, the young weary Wild Cards took on the Fraternity team, the Ballers. This Frat team looking to advance to the playoffs, needs 1 more victory to go 2-2. The game lacked a lot of luster because of the low scoring game. It was 7-2 Ballers going to the 4th inning, until Chad Emery who has been hitting the 3rd base foul line all day, finally hit 3 run-Homerun over the Yankee Stadium facade. However the game ended as the time expired. Wild Cards lose a close one 7-5. The Wild Cards return to Big League Dreams this time in Chino Hills. The last time they were in Big League Dreams was in Palm Springs (Tournament of Champions). Just their 2nd time in a PSTS tourney, the Wild Cards are looking to win it all as well break their curse against teams outside of Ventura County. Pumped-up Wild Cards score big against Mercy Rule. With the exception of Virgil Tomas, everybody got a at least 2 hits. Good defense and offense was sharp. First win for Wild Cards outside of Ventura County. After a long break, Wild Cards next opponent was Fury. It was see-saw battle as both teams exchange leads twice. Both teams hit well. In the 6th inning Wild Cards scored a big 5 runs to take the lead 10-8. However huge costly errors killed the Wild Cards as they give back the 5 runs in the bottom of the 6th which eventually cost them the game. Wild Cards lose a close one 13-10 and lose their shortstop Raul Narez with a severe ankle sprain in the 5th inning. All the Wild Cards need is to fight their long break syndrome and get the last win to advance to the playoffs. What was considered to be an easy win for the Wild Cards, turned out to be an huge upset. Wazzup who had 2 girls on the team, scored 6 in the first inning. In their bottom of the inning, Wild Cards rallied back with 6 runs of their own. It was tied 7-7 for a short bit until the 3rd inning, as Wazzup scored another 6 runs to lead 13-7 and added another run in the 4th inning, 14-7. Wild Cards didn’t score until the 5th inning as Anthony Dugas hit a 425 foot, 3-run Home Run over and out of Crosley Field. That made it 14-10. However not fazed by Dugas’s HR blast, Wazzup took advantage of Wild Card errors and hit a couple HRs of their own as they take a huge lead 18-10 to the 7th inning. In their last at bat, Wild Cards almost down but not out, rallied back with 7 runs which was sparked by David Loyola’s huge moonshot grand slam HR. Like Dugas, it went out and over Crosley Field. Few batters later, Wild Cards score another 3 runs. But it wasn’t enough as the Wild Cards came up a buck shy from tying it. In a upsetting victory, Wazzup eliminates the Wild Cards 18-17 from any playoff hopes. Wild Cards King of the Jungle as they sweep double header. Being in a pack of top rec division contenders on Thursday night, Wild Cards (Novice 7-4) face the Head Hunters (REC 9-1) in their first game. What first turn out to be a good match up, wound up one sided. Wild Cards Chomp Head Hunters 22-1. After scoring 22 runs against Head Hunters, the Wild Cards walk into the Lion's Den (6-4) in their 2nd game of their double header. Trailing 2-0 after the 1ts inning, WC came back with 1 then tied it and finally took the lead in the bottom of the 2nd inning to make it 3-2. It was short lived, because Lion's Den tied it with one run in the fourth. However, WC rallied 6 unanswered runs in their inning which was enough to hold off Lion's Den 9-5. Fresh from winning their SCMAF Qualifer tourney at Simi Valley, the Wild Cards scored a big 10 runs in the first three innings and thought the Peloteros were done. However somebody forgot to tell Peloteros that the game was over. The team rebounded and fought hard through 7 innings and a another 2 innings, to beat the highly favorite Wild Cards. Not only the Peloteros snapped the Wild Cards' 5 game winning streak (10 game winning streak if you include the 5 games from SCMAF tourney) but defeated the Wild Cards for the second time in a row in the league championship game. -Wild Cards scored 10 in the first 3 innings but only scored 1 run from the 4th to the 9 inning and loss 14-11. -Wild Cards had the chance to win it with the bases loaded and 1 out, but got into the double play and ended the game. -The loss changes the format of the tourney, as they take on Kruption. The Hard non stop hitting Kruption is Thursday Night's E/Novice 2nd place team. Rancho Santa Susana Community Park in Rancho Simi Valley was the site for the 2007 S.C.M.A.F Hi-Rec Qualifier Tournament this past Saturday. Ten Hi Rec teams gathered to play for the SCMAF Qualfier title in Simi Valley and earn a berth to Palm Springs Big League Dreams. One of those teams, the Oxnard Wild Cards will try to do the impossible but without key tourney veterans Danny Urquidez, Ray Jurado, Joey Ortiz and Mike Lara. In order to be competitive, the Wild Cards readjusted their roster with a majority of young players against other experienced teams in Simi Valley. Added to the team to replace Jurado and Ortiz are Chad Emery and Cody Stanley. These 2 young players will try to help Loyola, Garcia and Dugas and the rest of the Wild Cards reach the championship game. This was the first opponent and the first game of the day for these young and rejuvenated Wild Cards. It has become a heated rivalry between them and the Chamucos. 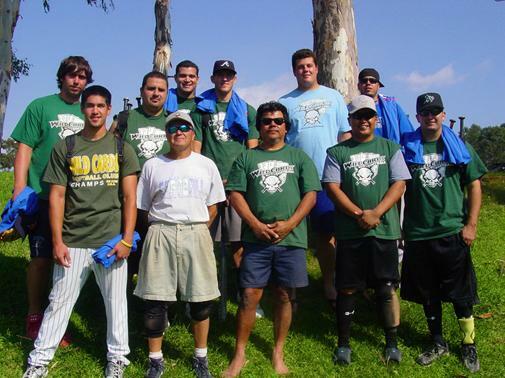 In past tourneys, Chamucos have defeated the Wild Cards and spoiled their quest for their championship title. Now the Wild Cards are looking seek redemption against the squad from Santa Paula. In the first inning, the shorthanded Chamucos took a 2-0 lead in their first half of the 1st inning. It didn’t take long for the Wild Cards to rally back with 11 unanswered runs of their own. Back to back triples by Ronnie Lemos and Raul Narez started the 11 run rally followed by a barrage of hits from their Wild Cards team mates. Every WC player has at least 2 hits in that game. What looked like a easy victory for the guys from Oxnard, the Chamucos gave them a reality check by roaring back to make a game of it. However, the Wild Cards defense and strong pitching of Raulo Romero shut down Chamucos hard hitting-up-the-middle offense for 3 innings to give the Wild Cards the 19-17 win. Raulo Romero and the Wild Cards waste no time from their very short break as they played the team of football players called, No Chance. Strong defense and their high powered offense kept the steroid enhanced players of No Chance from mounting any rally during the first 5 innings. However taking them too lightly and being distracted by No Chance’s hot girlfriends, the Wild Cards managed to hold off their last inning rally to win 16-10.
resulted in outs and helped the Wild Cards win. After playing back to back games, Wild Cards took an hour break to eat and relax before they played GRSC. GRSC, in only their 4th tournament, was coming off of a big 14-team tourney SCMAF title win (April 7th) from a month ago, was looking to do it again. Once the game started both teams exchanged blows as it became see-saw battle. Wild Cards took a 4-0 lead in the first inning. Thanks in part to 6 straight singles by Raul Narez, Anthony Dugas, David Loyola, Bobby Garcia, Shawn Palmer and Franics Unson. The lead was short lived because GRSC stormed back to tie the game 4-4. In the 2nd inning, Wild Cards retook the lead 8-4 only to give the runs back to various hard liners up the middle by GRSC. With a few adjustments to the defensive alignment, the Wild Cards managed to hold GRSC off long enough for them to double their score. GRSC tried to come back with a late inning rally. However, a stingy Wild Cards defense and a pitcher named Raulo Romero stopped them cold. Wild Cards win it 23-16 and continue their (5-game winning streak) dominance over the Grim Reapers Softball Club. In the first inning, the motivated Bad Guys drew first blood by scoring a big 5 for the lead. However, the Bad Guys’ pitcher had huge control problems. Giving up 5 walks in the first . 3 consecutive walks to the first 3 batters (Lemos, Narez and Dugas). Followed by a combination of singles and doubles by Bobby Garcia, Shawn Palmer, Francis Unson, Chad Emery and Cody Stanley. Then a couple of walks with the bases load, by Raulo Romero and Virgil Tomas. After 2 more walks, 2 more singles and 3 more runs, the Wild Cards took a 9-5 lead in the first. The game was relatively close until the 5th inning when the Wild Cards exploded for 5 unanswered runs and came away with the victory, 17-9. The win gives the Wild Cards a ticket to the Championship Game. 2 great catches that ended the Bad Guys' 2 huge inning rallies. and second and the go ahead run at the plate with 1 out, one of the No Chance batters hit a line drive to right center only to be denied by a great diving catch by Chad Emery. After the great catch, the third out was a can of corn. Wild Cards win 13-11. Congrats to Wild Cards winning their 4th SCMAF Qualifier. Props and Congrats to the MVPs of the SCMAF Tourney - Cody Stanley and Chad Emery and Wild Cards - Virgil Tomas, David Loyola, Anthony Dugas, Francis Unson, Raul Narez , Bobby Garcia, Ronnie Lemos and last, but not least Raulo Romero you're an animal. Great team work Awesome job! With one week to go, Wild Cards and Peloteros go down the wire as they play their last games against P&G Diehards to determine who are the league champs. Both teams are both tied for first place. Destiny is in the hands of both teams. One`will be champs and one will the first place Losers. If the Wild Cards and Peloteros wound up winning or losing their last games they play a tiebreaker. The Date TBA. If the Wild Cards win and Peloteros lose, the Wild Cards take 1st place. If Peloteros win and the Wild Cards lose, Peloteros take 1st place. Missing 3 ACES, Wild Cards still pull out a Straight victory. by defeating 2 time Rec City Champs, Water Way 12-8. Thus eliminating them from the league title chase contention. 10 runs, it sparked the offense to have big innings in the 4th and 6th inning. Key hitting by Shawn Palmer, Aaron Ayala, Ray Jurado, Jaime Rabago and Virgil Tomas helped crushed Waterway's bid to win league and revoked their invitation to the City Championships. IT might be a 2 team race to be league champ. Wild Cards must win their last game against P&G Diehards to either remain tied or be in first. May 17th will decide who is the league champ. GREAT JOB GUYS. SPECIAL THANKS TO PJ NAVARRO, FRANKIE AVARADO AND LARRY LOPEZ for helping us out. We appreciate it! (Asian) Wild Cards players Lucas Wangen sends his best from Iraq. Lucas sends us a few pics of the field in Iraq. One of a few softball fields that can get hit by a an enemy mortar. This field is almost similar to the Diamond Backs' stadium. Only this one is a lake and if you try hard enough you can go through the fence and crash in the lake.